Some of the most compelling aspects of our collection are those documents which reveal student voice. The Arthur Sporne archive collection includes essays and letters written by pupils to their teacher, Sporne. ‘Story of My Life’ essays written by 14 year olds in July 1914 give insight into the lives and hobbies of children on the brink of the First World War; whereas similar essays from pupils in 1952 illustrate childhoods defined by the Second World War. Today I wanted to share a letter from 1917. 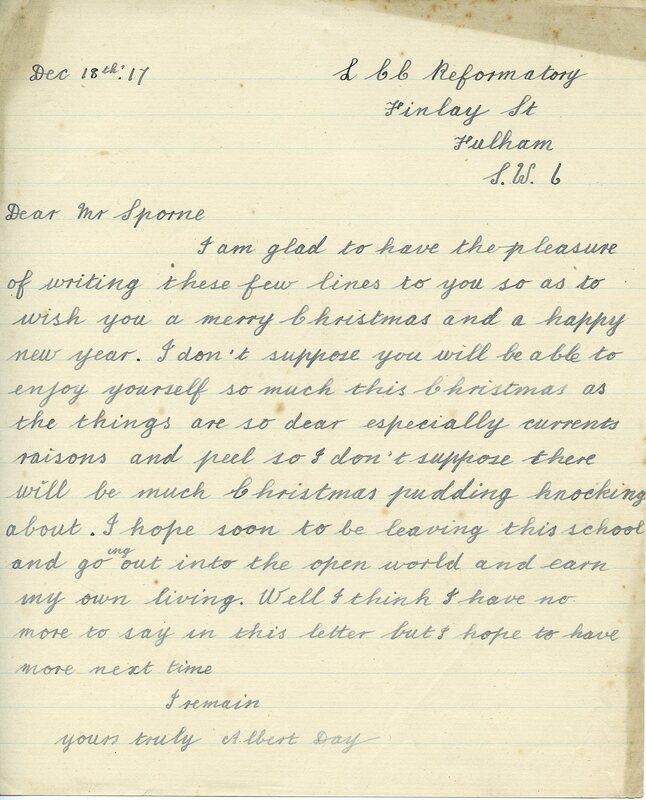 Sporne had recently taken up a teaching position at Fulham Reformatory School, and pupils wrote letters to him, discussing the end of the school term, the Christmas holidays, and plans for the following term. If you’d like more Christmas in the archives, head to our catalogue. And in the meantime, we hope you all enjoy the holiday season! The IOE closes Tuesday, December 23rd at 4.30pm, and reopens Monday, January 5th, 2015. The Archive Reading Room reopens Monday, January 12th (after a week of stock-taking). We have two fairly big announcements to make! Firstly, some of you are likely up to date on this, but the IOE has now officially merged with UCL. As of December 2nd, we are now the IOE Archive at the UCL Institute of Education. For more information on the merger, visit here. Secondly, our Archive has been awarded National Archive Accreditation status (which was also made official on December 2nd… December 2nd was a pretty big day around these parts)! The IOE Archive is the first archive of an educational institution in London to be accredited. Accreditation is the new UK quality standard that recognises good performance in all areas of archive service delivery. To achieve accredited status, an archive must demonstrate that it has met clearly defined national standards relating to the management and resourcing of the care of its unique collections and the service it offers to its users. [They] were very impressed with the application and the range of ways in which the service is delivering its mission. They noted specifically the excellence of the documentation submitted, which reflects on the service’s strong management and planning. They congratulated the service on its achievements and innovative good practice in many areas, specifically developing outreach, broadening the volunteering offer and tackling digital preservation issues which many larger and better-resourced services have struggled to address. We are so pleased to now be fully accredited, and want to thank the accreditation team for all of their help and support as we went through the application process. For more information on accreditation, head to the National Archives. History teachers aren’t faced with the easiest of tasks; it’s already a challenge to engender a memory of events that students (and often teachers, themselves) didn’t experience first-hand. Teaching the First World War, a war often seen as morally neutral, can be doubly tricky. In history lessons, there are aspects that are black and white: Asquith was Prime Minister in office at the outbreak of war; the Battle of Liege began on the 5th of August, 1914; the war was primarily fought in trenches. But it’s the grey areas that also need addressing whenever we teach, talk, or even think about the past. Aldridge pointed out that, as educators, whenever there’s reasonable disagreeance on an issue, we need to teach that variance. Aldridge argues that the horrors of war need to be communicated for students: images and narratives of soldiers – including children and young adults – killed or wounded. He advises educational institutions to ‘consider whether the rituals and practices they engage in around remembrance successfully communicate the horror of war’ (Aldridge, 2014: 6). Aldridge’s fellow panellists also shared their thoughts. Jerome Freeman, Director of the First World War Centenary Battlefields Programme (run by the Institute of Education and Equity), emphasised the importance of going beyond the horror to encourage students to really discover the First World War. While schools often opt to teach the Second World War over the First, the FWW has been largely undertaught. The Battlefields Programme enables two students and one teacher from every state-funded secondary school in England to visit battlefields on the Western Front between 2014 and 2019. Students are encouraged to research their own family connections to the war, but the tours are important historically, not just emotionally. Freeman emphasised the significance of discovering the political and social consequences of war, while also engaging with historiography – was it a just war? What were the consequences? The tours are built around these key questions, while also probing the issue of remembrance. Who, what, why and how do we remember? In the IOE Archive workshops we deliver in local primary schools, we use archives to tell the stories of ‘ordinary’ individuals during the war. How did the Great War impact men, women, children? These details range from photographs of children setting up gardens to address food shortages on the home front, to letters describing life in the trenches, to applications made to tribunals for exemption from military service. 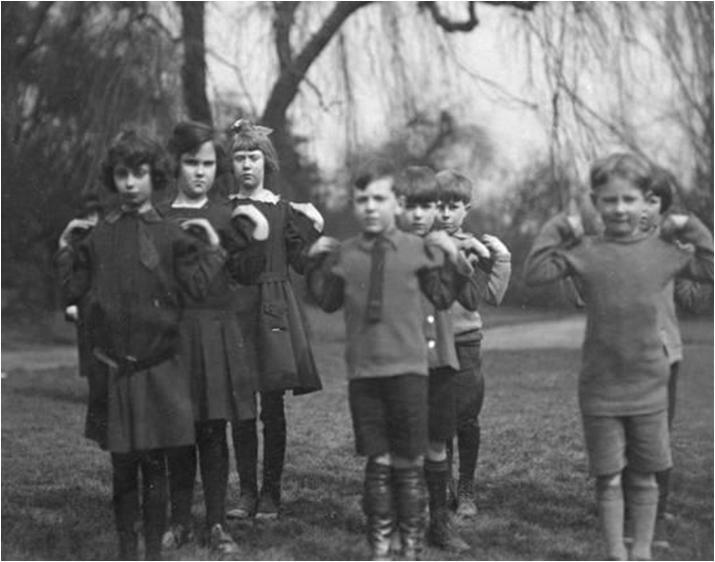 Working primarily with primary schools, we ensure the horrors are not overplayed; rather, children develop a sense of how nearly every aspect of life was impacted by the war in some way. Pupils tend to a school garden. 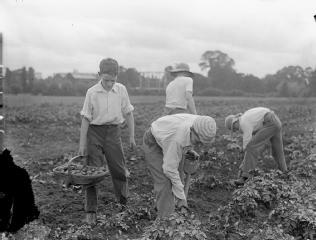 Allotment-style gardens were developed in available areas of land during the Great War – including school playing fields. However, that doesn’t mean skirting around the terrors and tragedies of the war, including the realities of Britain’s own role. We worked with a Year 5 class in Camden who were busy learning about conscientious objectors. Through the archives and classroom discussions, students were fully aware of the harsh consequences faced by COs. Moreover, as pupils carefully considered why pacifists objected to serving brought to the fore the daily realities of war: the very fact that, as Aldridge pointed out, ‘war is killing, not just dying’. As with teaching of any sort, there is no ‘right’ or ‘wrong’ way. But we also have the knowledge that history too often repeats itself. One of the best things we can do as educators is to ensure students have a multi-faceted understanding of the range of issues and perspectives which surround any historical event, particularly when it comes to conflicts and peace-keeping. Aldridge suggests it’s imperative that we remember the horrors of war, ‘so that we continue to make every effort to avoid or at least condemn unnecessary conflict in the future’ (Aldridge, 2014: 5). While our archive collections don’t contain a great deal on the graphic horrors of war, the National Union of Women Teachers collection contains papers, leaflets and correspondence relating to the post-war peace movement and their support of/for conscientious objectors. I should apologise for how quiet this space has been lately! The beginning of the academic year has been particularly busy here in the Archives. We’ve been out in classrooms, delivering new archive workshops for primary schools. Over the next week or two, I’ll be giving an update on the sessions, the histories revealed, the collections used, as well as posting resources that may be of use to educators out there. With the centenary of the First World War, schools across the country have been doing amazing projects: digging trenches in the playing field, rehearsing remembrance day plays, and going on field study trips to museums and war memorials to develop their understanding. We’ve been bringing archives into classrooms to investigate what life was like in 1914… how did the war affect men? women? conscientious objectors? children (from P.E. class to school dinners)? Keep tuned into this space, but in the meantime, head over to London Metropolitan Archives’ First World War blog, ‘Emergency! London 1914’. We are this week’s guest blogger, opening up the archives to reveal the impact of the First World War on women teachers. They – imperatively – help students understand the basic tenets of source-based research: what archives are; potential biases; gauging reliability of sources. They encourage students to get excited about the past. This, for me, beats any conversation about the principles of historiography (no offense, historiography; you are still important). The immediacy of archives allows students to take a hands-on engagement with histories of individuals, places and situations that are often relatable to their own lives. However, archives can also play a significant role in a less obvious aspect of the curriculum: the creative writing strand in Literacy. A few months ago, Professor Dominic Wyse delivered his inaugural professorial lecture here at the IOE, on the topic of creativity and the curriculum. He touched on the potential danger of replacing the creative writing process with didactic, rote grammar instruction. While grammar instruction is an absolute necessity, what is also a necessity is providing students with dedicated time, opportunity and encouragement to simply write creatively. I apologise for this interminable introduction to today’s topic: archives as a catalyst for creative writing. Take, for example, the role archives played in one musician’s song writing. As a transplanted Canadian living in London, I am prone to nostalgia and sentimentality about anything related to Canada: maple syrup; Alice Munro; ice hockey (I don’t even like hockey); excessive friendliness; etc. But really, what better incites a wave of nostalgia than music? Enter Canadian musician, John K Samson, also of the band, The Weakerthans. Through each of his albums, Samson scatters his lyrics with references to Canada (the loonie, GST, curling and his hometown of Winnipeg, Manitoba), in songs that are quiet, loud, melancholy and sweet. My idea was to research four different stretches of road in Manitoba and write three different songs about each of them and use techniques and research as well as exploring the places themselves and just try to use different strategies to try and get a sense of each of these places. Samson went about creating a ‘musical map’ of Manitoba. He ‘talked to relatives, friends and strangers; he visited archives, a tuberculosis sanatorium-turned-RV park, a forgotten cemetery’ (johnksamson.com). With visits to the Archives of Manitoba, Samson was drawn to ‘the way the places were framed by someone’s eye back then. When I visited the sites they were different but unchanged. It gave me a richer idea of places’ (CBC). We all know archives do their job when it comes to academic, historical research. But a well-referenced thesis or book doesn’t have to be their end point. At the heart of any archive collection is its potential for users (and writers) to piece together a sense of a given point in the past. Whether it’s exploring a person (characterisation), place (setting), or event (plot), archives can both inform and inspire the creative writing process. Educators, you can find creating writing prompts in our archive learning resources. They can be used in conjunction with current areas of study (equal rights; women’s movement; etc. )… or as a stand-alone writing exercise for those days you need a last-minute lesson. Lastly, even if you’re not Canadian, go take a listen to Samson’s Provincial. A personal favourite is ‘Ipetitions.Com/Petition/Rivertonrifle’ – the title is an actual online petition to get Reggie Leach inducted into Canada’s Hockey Hall of Fame in Toronto. Again, I don’t even like hockey. If you like hockey, Canada, or simply a bunch of Canadians in toques, watch this video on the project: We, the Undersigned. And since we’re a university archive, for the grad school students: ‘When I Write my Master’s Thesis’ (with a nod to cotton gloves in the archives). So what is it like volunteering at the Institute of Education? First of all, I had wanted to do some volunteer work for a while, I needed something to put on my CV and I like the feeling of doing something useful. I didn’t know what the Institute was or what it did. I did know it was an Educational organisation; I liked that because it suggested a certain higher level of professionalism. Later I found out that a lot of Teacher Training went on here. But the section I had volunteered for was the “Archive”. It’s a library within a library; far beyond the stacks of books to be borrowed or just pulled off the shelves and read, this was the place where the deep documents were stored; the source material, the stuff that needed to be preserved through time. I have a long-time love of libraries, I’m a voracious reader, I like the atmosphere, I like being surrounded by books and wherever I go I get a membership at a local branch; so I have a certain familiarity with library procedure and library culture, but this was different, this was …mystery. Don’t you get the impression archives, any archives, not just the Institute of Education’s, are where the truth is kept, where you get the real story? But this is neither here nor there. You want to know about volunteering at the archive. Over the next few months I was to take on a variety of activities; the Archive puts on a number of displays and shows throughout the year, and this involves the preparation of a lot of visual and text material, so I was involved in printing, trimming, and laminating such materials, I also had a chance to visit the archives long-term climate-controlled storage (surprisingly not old and dusty at all, but bright, modern, and clean.) Most of this was to be later. Well the first person I met was Alix, she is very easy-going and well organised and she put me to work on the project digitising materials belonging to The National Union of Women Teachers. They were big back in the thirties and best of all they left behind a ton of documentation in the form of printed publications and photographs. My job has largely been to scan the photographs. When you see a documentary about, say the Edwardian era, you’ll get some photos, maybe some talking heads giving you an informed opinion about the time. Scanning photographs circa 1925 to 35 (very approximately) is nothing like that. Try this, the faces are not like our faces, they have a characteristic that is of their era, I cannot say exactly how, but they do. Scanning so many photos gave me strong impression of the era without a lot of specifics; it was heavy on the atmosphere. Most, but not all, of the images were of women of the Union, officers of an organisation which fought for equal pay, equal treatment, for higher quality in education, and the professionalization of their career; they were passionate about more than just themselves. In some ways they saw their cause as a patriotic one. I learned a lot, most surprisingly some the members were also barristers and they did the Union’s legal work. I was impressed with the mettle of members who had overcome barriers in what can still be an unfriendly environment for women. I scanned hundreds of photos and I was impressed with the seriousness and toughness of these people; it was a different era, there was no such thing as “having it all” in that era, most of them as I was to later learn were unmarried since the laws and regulations of the time disallowed them from continuing their profession after marriage. They faced having lower wages than their male colleagues (who were assumed to be supporting families); they were often barred from educating older boys because it was assumed an unsuitable position for a woman. They were often passed over for Head Teacher positions despite their seniority. Through all of this they endured. If there was a phase that came to mind constantly it was “no nonsense”. My education is from the seventies but I could imagine any of them as the tough old fashioned head-teachers of my time; there was something there I recognised very much. The photographic scanning is largely finished; there still may be an envelope of two marked “fragile “, that remains to be done. 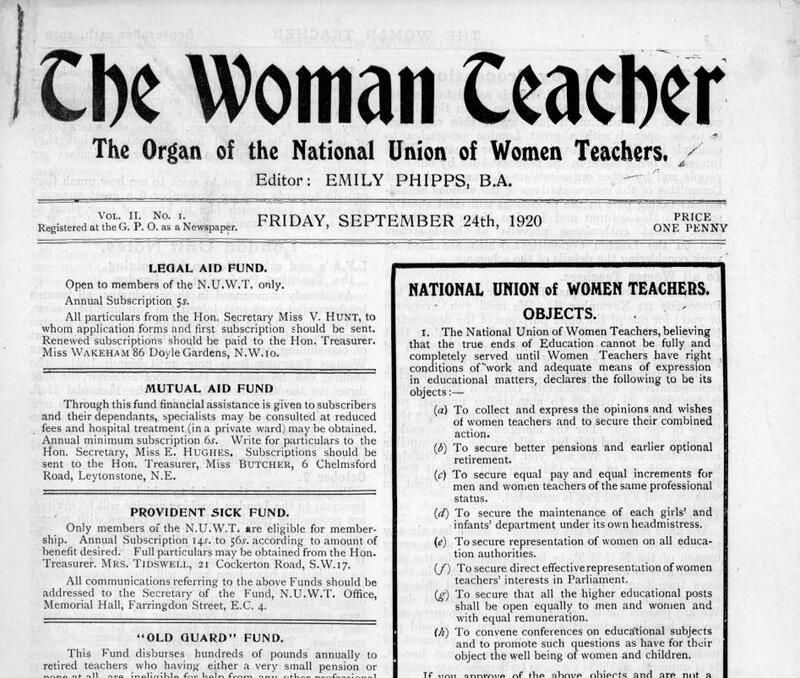 I did (as indicated) go on to other things, including proofing the scans of the Union’s newspaper “The Woman Teacher”. It was here that I got the context for the images. The organisation was not just a political talking shop (although their tireless campaigning was their main activity), it provided an emergency pension for retired members who had fallen on hard times, organised fact finding overseas tours to Canada, Italy, and the United States. It even served as a form for cultural pursuits like literature and the theatre. They had friends in high places like Lady Astor. They tussled endlessly with successive governments both Labour and Conservative. But mostly they fought of equal pay and treatment for women in the teaching profession. And their struggle is still relevant, I just read that women’s pay has actually decline in comparison to men’s, there is still some way to go. 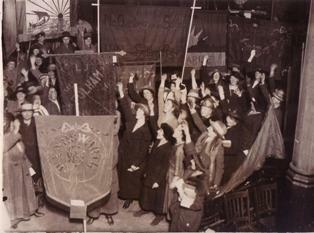 But As I write this, I think, the story of The National Union of Women Teachers is just one. There must be hundreds, thousands of other stories about British education in the twentieth and twenty-first centuries in those cool rooms underground, just waiting to be unearthed and told. And thing is, I can’t imagine what they might be. So, what is volunteering at the Institute of Education’s archives like? As always, a huge thanks to our volunteers like Jeremy. And Jeremy, thanks for taking a break from all of the digitisation to write this for the blog! We are members of Volunteer Centre Camden, and highly recommend them in terms of volunteer recruitment and best practice support… it’s a great organisation with lovely staff.